In Year 5, children are chosen to be Eco Warriors. They are then responsible for lots of Eco issues around the school, including monitoring the recycling of waste, water usage and the school commute. Walking to school helps our planet and you stay well. Remember to SMILE on your way to school! With Mick Brazil, Year 3 created a song to encourage us to walk to school! We asked the children to snazz up their shoes for walk to school week. Here are all the children who took part. We were very impressed! Middle Street works hard to reduce, reuse and recycle waste. Click on the links below to see animations Middle Street children made with Dan Evans of Tilt, encouraging people to stop littering. During Walk to School Week, the Eco Warriors filmed children as they walked to school with their parents. 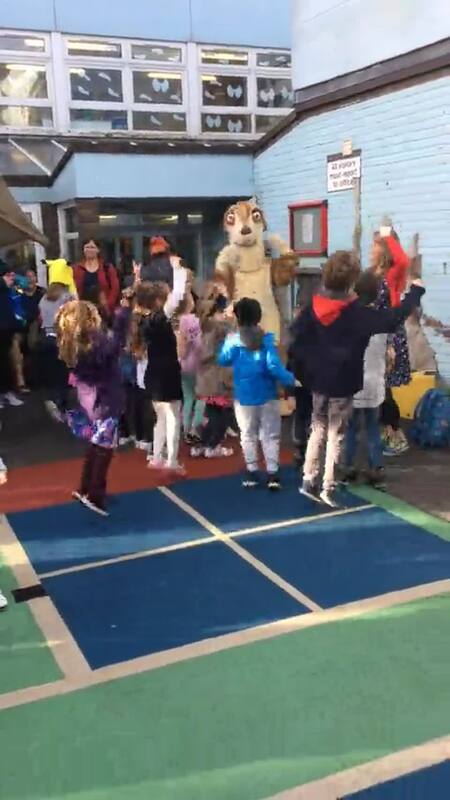 Children had a surprise when they were greeted by the Walk to School mascot.